Big data is a broader term in the sense that it is used for very large data sets which are considered so complex and informative on which traditional data processing applications are considered as inadequate. This is the kind of extremely large data sets that are analyzed through computational algorithms in order to reveal patterns, trends, associations and differences specifically related to human interactions and behavior. Big data is considered as an evolving term that is associated with large volume of structured, semi structured and unstructured data which has the potential to become information after mining and mapping the data. As big data is associated with very large amount of data sets, therefore it does not refer to any specific quantity. However data in terabytes, petabytes of exabytes is considered as big data. As we know that computerization and automation of the data with ease in access to information through information communication technology (ICT) and business processes reshaping rapidly, so there is an increase need for such professionals who are equipped with the computational and analytical skills to handle big data and its management. Big Data certification from Brainmeasures is the right choice to fulfill the gap that is much needed now-a-days from educational, researcher and business community. This is a unique and compact certification program which will enhance your expertise and efficiency to manage and analyze big data in complex environment. After transfixing on big data by studying from Brainmeasures, you will be able to know about big data requirements, complexities, technological foundations and how to analyze it. So, don’t look around for other opportunities and get yourself enrolled in the Brainmeasures big data certification. The course is not designed to just deliver the knowledge. An online exam with small case studies is also the part of the course to assess the knowledge and skills that you will gain during the certification program from Brainmeasures. After successfully passing all the required stages of this course, you will be awarded the certificate that will acknowledge your efforts which will lead to an added point not just in your Resume but also in your professional career path. 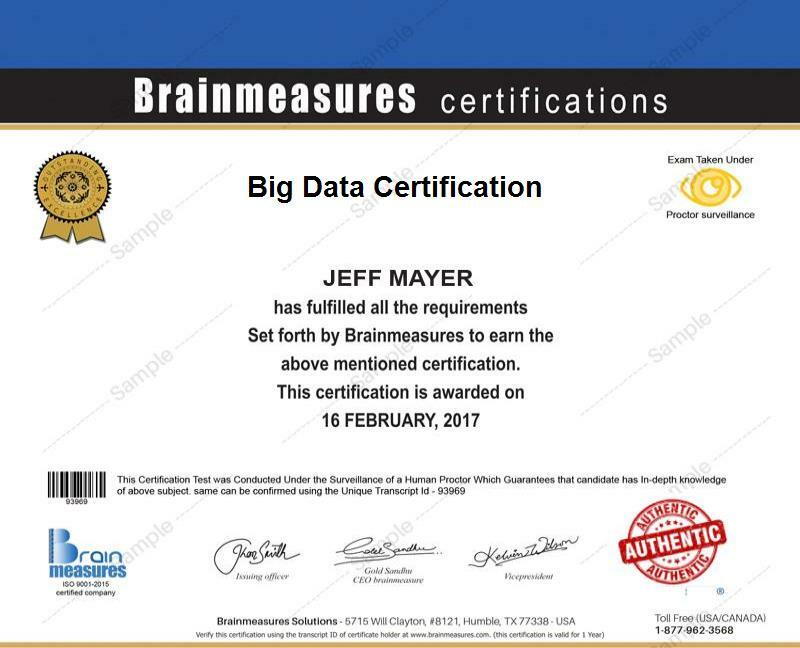 Entitlement of big data certification from Brainmeasures guarantees you a verified and proficient expert of big data analyst with command over performance evaluation and information management in complex environment. This certificate definitely an add skill to increase your earnings or to get promotion in your career. Average annual salary for those who hold different positions in administrative, marketing management and analytical domains in different organizations is $50,000-$90,000 per year and this amount may vary significantly based on the type of industry (i.e. IT, Servicing or Manufacturing etc. ), nature and reputation of the organization, location, education, skills and experience of the candidate etc. As big data provides ample of opportunities in every aspect of field, especially in business where future planning and decisions are based on facts and information generated by data. Inexpensive storage, transformation of data and information into digitization with increasing rate of use of electronic and social media networks have led to an explosion in data. This provides the marketers opportunities and threats both for getting customer opinions, observing market pressure and offering better products and services to target markets. Studies are being conducted to identify the widening gap between market complexity and capacity of organizations to efficiently manage and cope with complexity. Big data is offering organizations numerous ways of earnings, targeting customers and to serve them with better facilities in these days of stiff global competition and digital world. So, big data certification is important not only for those who are working as business analysts, office managers, business developers, information analyzers, reporting analysts or data mining experts in different businesses but it is equally important for students, marketing and business researchers, business teachers and presenters as well. This certificate is designed for all those people who are working in automated business environment and who are primarily linked with application of analytical and top level skills for business management and development. Beneficiaries of this certification program are office managers, database managers, software engineers, data analysts, ERP specialists, business executives, chief operating officers, business owners, students, teachers, researchers and all business professionals etc.